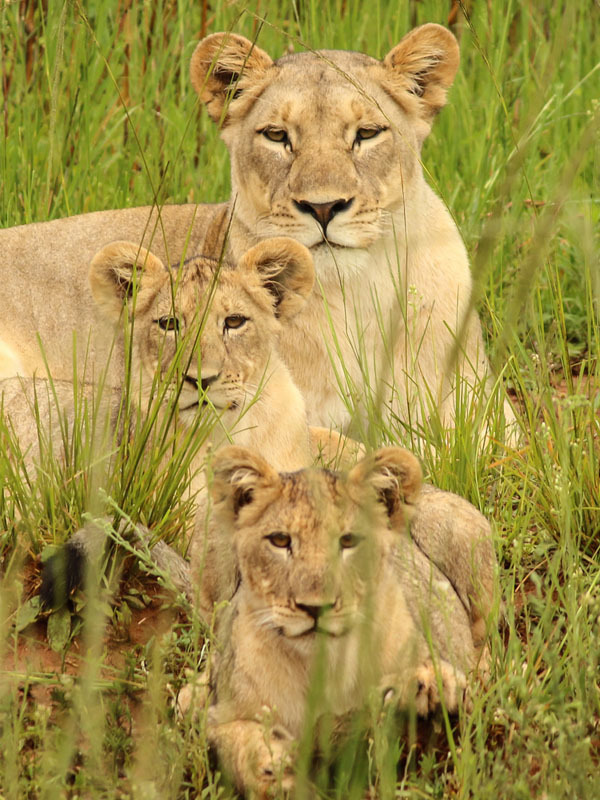 The big 5 adventure circuit is bookable twice a month, and runs on fixed departure dates. You will find those dates at the bottom of the page. Please select the month you would be interested in, and we will get back to you with availability. 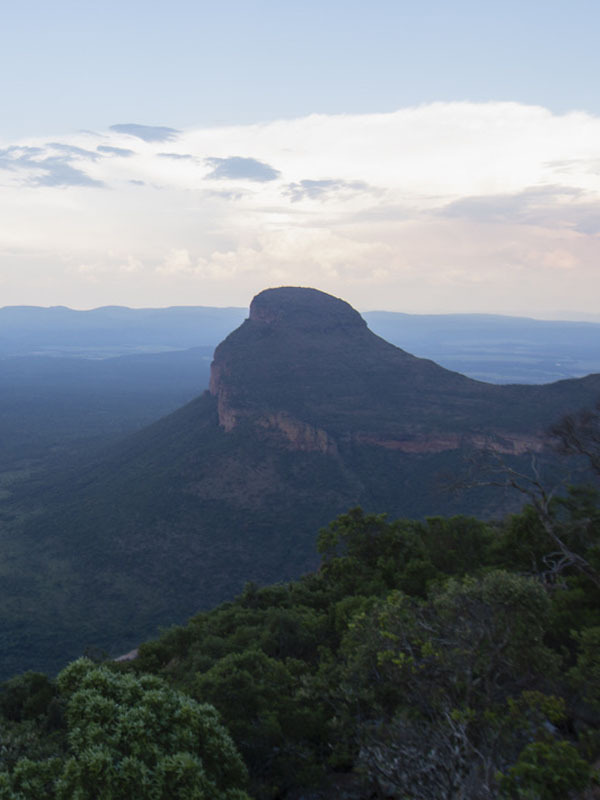 This package ride, is essentially a circuit, where we combine nights at two of our preferred lodges and fly camp in order to convey the full beauty of the landscape and diversity of the land, seeing as these locations are in different areas of the reserve. Each location which we spend the night at, is chosen for its own specific charm. If you would like to know more about the lodges we use on our route, and the fly camp please see the description for each venue under PRIVATE RIDES. Private rides are bookable for 2 people or more with dates on request. Packages can be tailor made (subject to availability). Minimum duration 4 nights, maximum duration 7 nights. This ride is ideal for people who are not so flexible when it comes to travel dates and duration of stay, or who are travelling with non riders. On this ride we will adapt fully o your needs and preferences when it comes to time spent in the saddle and type of accommodation. 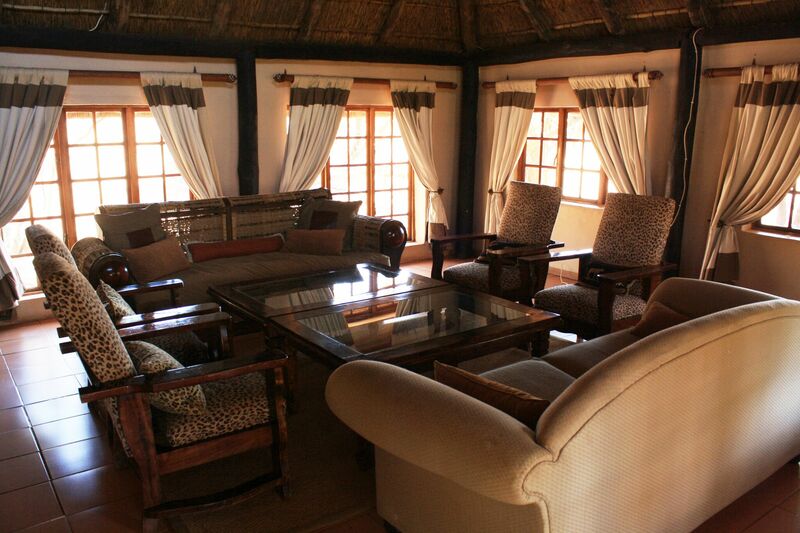 Therefore we have a selection of lodges which you can choose from, to create your dream holiday. 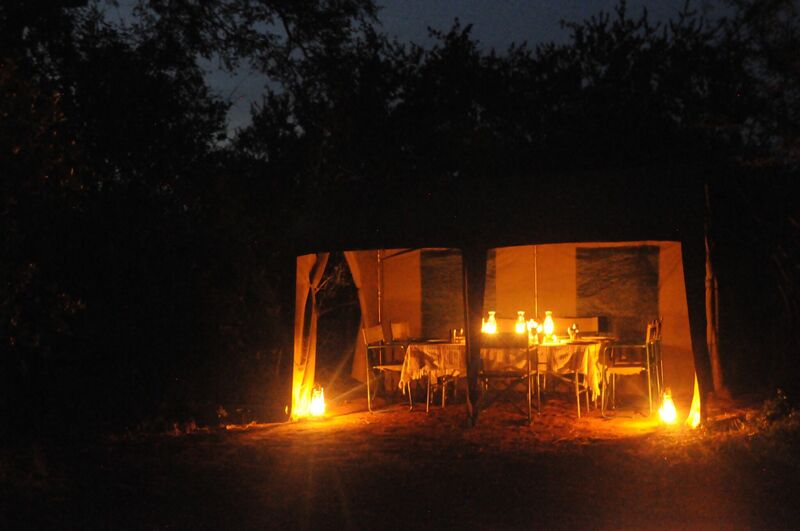 Stays at fly camp must be for a minimum duration of 3 nights camping. Contact us with your ideal itinerary and we will propose a program which will suit everyone in the group. Let us know if you are traveling with non riders or novice riders and we ill adapt the program accordingly. 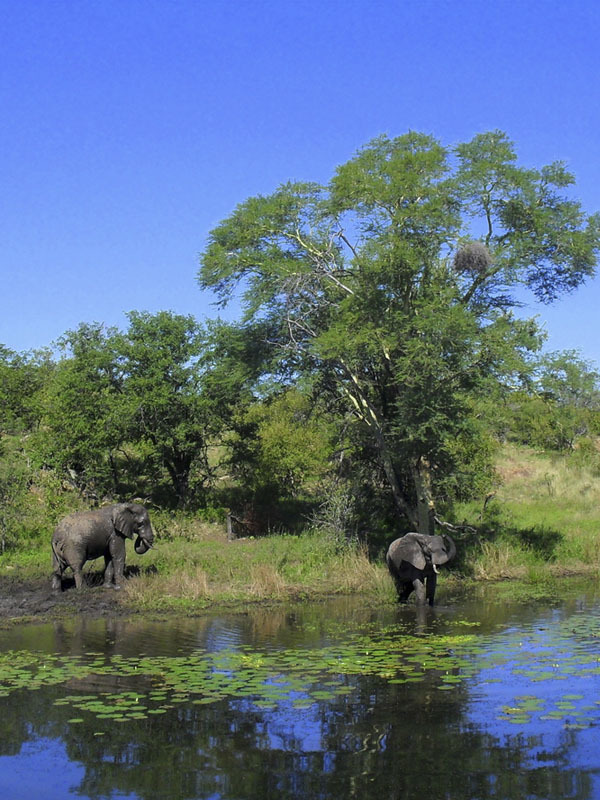 Lakeside which is on the upper escarpment set on the banks of the 1.7km lake with resident pod of hippo. 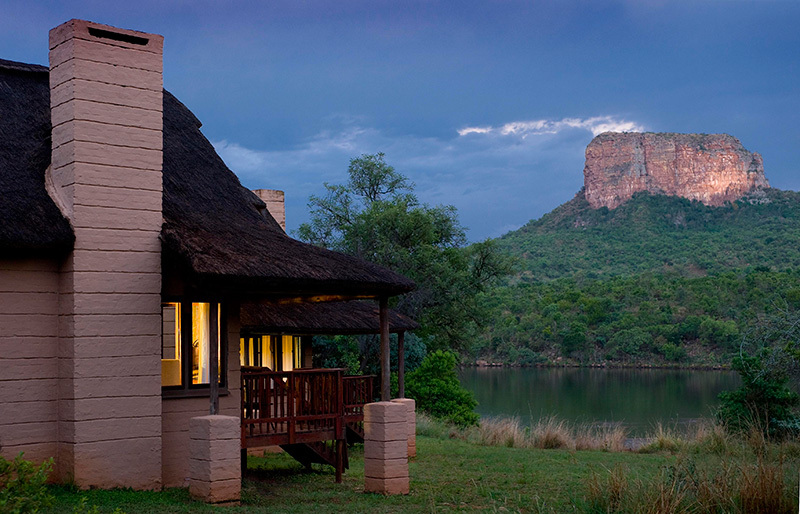 The thatch and stone Lakeside Lodge provides a memorable blend of luxury and wilderness, with Entabeni Mountain as a back drop. 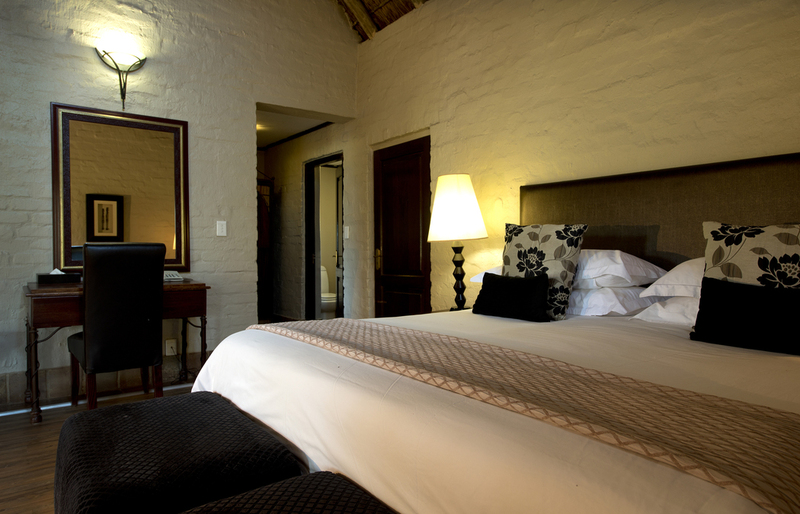 Double/Twin rooms are equipped with tea/coffee station, minibar (stocked on request), ceiling fan and hairdryer. Enjoy sundowners on your own private deck with the ever-changing colours of the Entabeni Mountain reflecting in the Lake. Ravineside which is on the upper escarpment and located under the shadow of Entabeni Mountain. 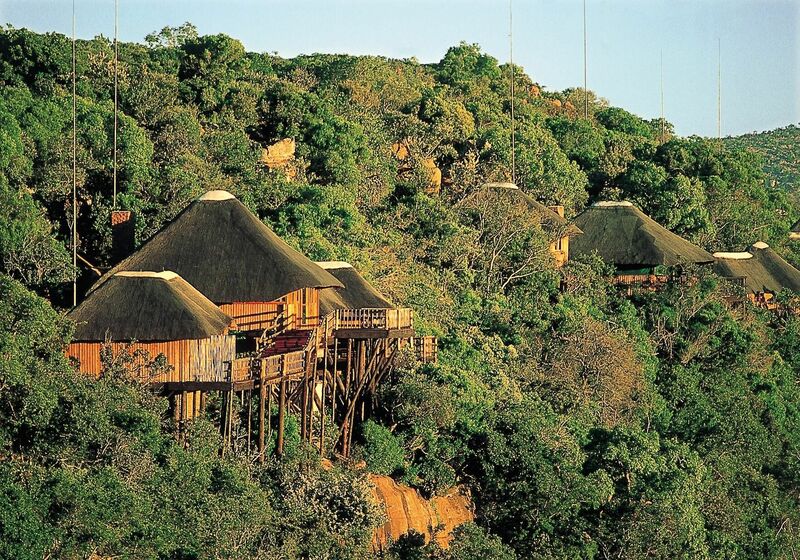 This is a thatched wooden lodge, built on stilts and hugging the cliff edge offering spectacular views of unspoilt ravines and wooded hillsides. 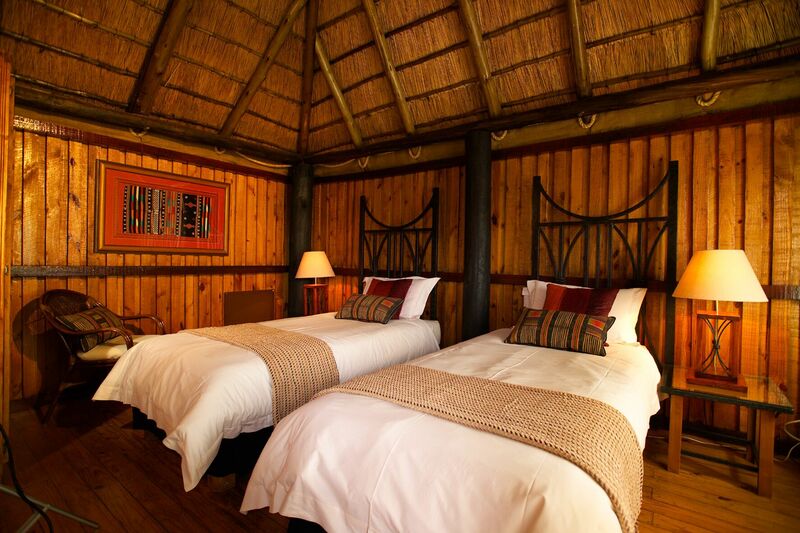 The Lodge boasts double/twin chalets with a lounge which a charming fire place and bar. A minibar fridge is available in the lounge areas (stocked on request). 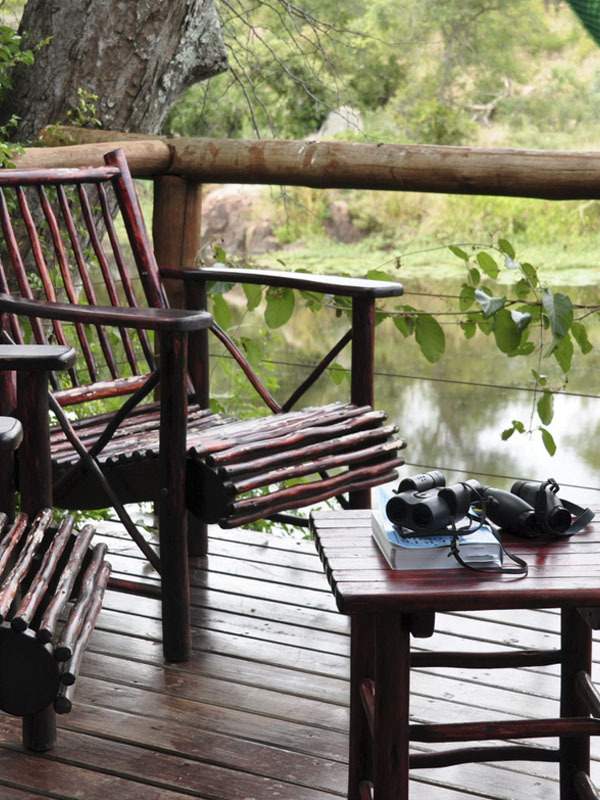 From the open sundecks, guests can indulge in bird and game watching and experience the beauty of the ravine while listening to the rippling sound of water from below in the valley. Our fly camp is set up specially exclusively for the group booked, and can be broken down again without a trace after departure. 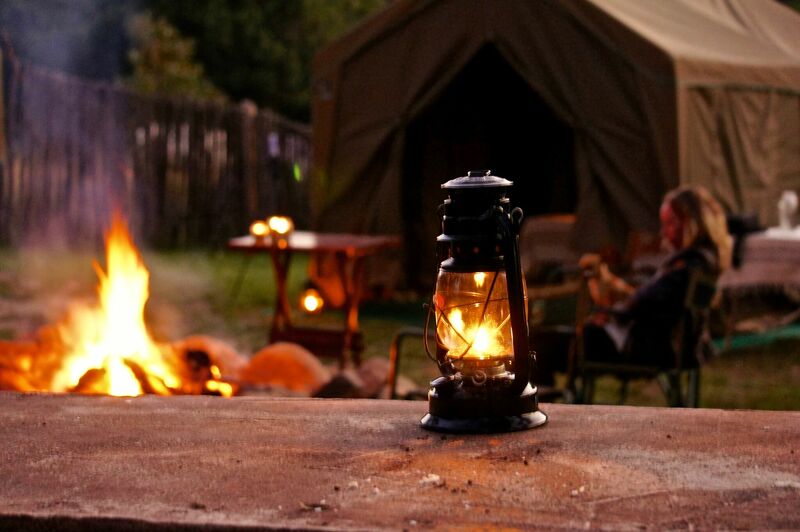 We choose the location for its natural beauty, safety and ambience so to allow guests to experience the true wilderness and spend a few days under traditional style canvas tents. Each tent can sleep two people, in military style bed frames, a comfortable mattress and white linnen and duvets. The tent is high enough to walk in comfortably and is finished with a carpet and a bedside table. The real African experience is guaranteed while camping at a river with clear spring water which runs during the summer months. Dinners in the riverbed, are a must at this location as well as cosy evenings by the fire after the days ride to discuss the happening of the day. Confirmation – 61 Days prior to date of arrival: 30% non-refundable deposit is forfeited. 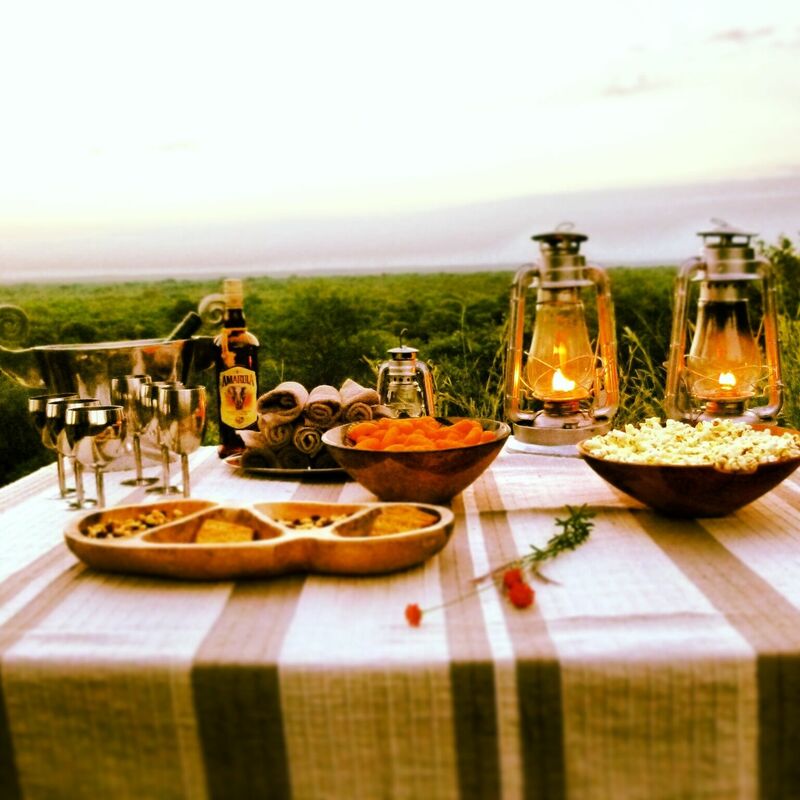 60 – 0 Days prior to date of arrival: 100% of total safari cost is forfeited.